Blogging is hard. You have to think up a topic, write a catchy title, then actually write the post. And, none of that includes any of the image creation, photography, setup, and so many other little details. 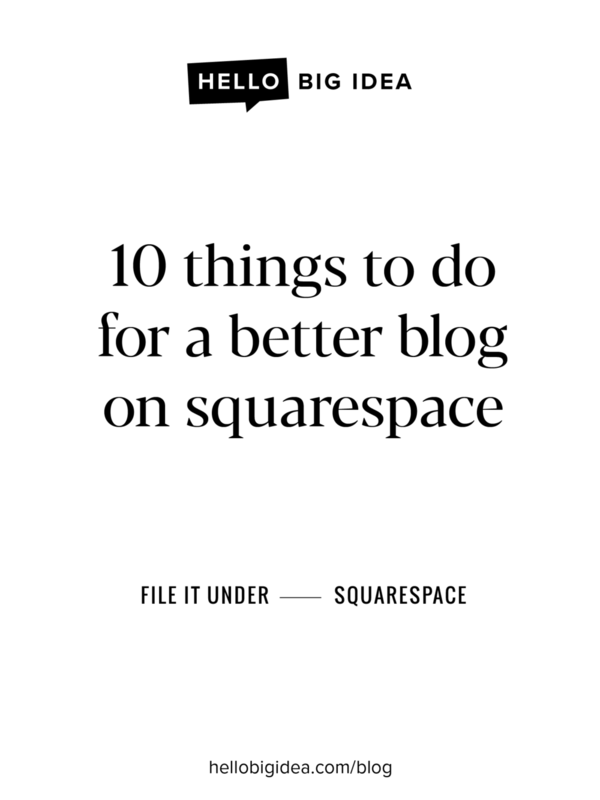 You guys know we are Squarespace everything around here, hence this post on 10 reasons to be on the platform. So, if you're on Squarespace here's some simple things you can do to make sure each blog post goes a little bit farther and works a little bit hard on your website. These are main themes or ideas that you blog about. Create less than 10 or more than 3 that encompass what you write about to help organize your content and make it easy for your readers to find related posts. These are words that would describe specific details of your post. These are great for SEO! Think of these as a search engine indexing tool. You can add both tags and categories at the bottom of the 'Edit Post' window. This is so helpful all throughout your site and when people share your blog posts. This is the main image that represents your post. This is what pops up if someone copy and pastes your link to a Facebook post or if you were to put a Summary Block of other posts throughout your site. Add a thumbnail to your post under 'Options' when you're editing your post content. Here's an example of how we use a blog summary content block on our own site. This our home page with our three most recent blog posts. This makes reading your blog easily accessible for those landing on other pages of your website. This excerpt will be the words that pop up under your thumbnail and before a 'read more' button. This gives your reader just a small preview of what your blog post is all about. Copy and paste the first 2 or 3 sentences of your blog post into the except box. This can also be found under Options in the Edit Post box (next to the thumbnail option). 5. Customize your post URL. In the same place you'd update a thumbnail image and add an excerpt is a place for you to customize the post URL of your blog post. This should relate to your blog post title using at least a couple key words that would help your blog post pop up under a google search. 6. Make all your blog post images the same width. This helps your readers eye flow through your blog post. It's an esthetic thing! It looks nice and it creates consistency. It's super unpleasing to the eye to have big and small images mixed through a blog post. 7. Add a summary block (carousel) at the end of each post. This serves as an option for "you might also be interested in..." and allows your reader to stay on your site and keep reading! Isn't that the goal? Once they get to the end of your blog post, provide them with more posts to keep reading. Otherwise, they have a reason to leave your site. 8. Add summary blocks throughout your site. You can do this in the same way you add these to the bottom of your blog posts. Suggested pages to place this kind of summary block on would be on the home page and at the bottom of your contact page. *Tip - filter your summary block by a category or tag to help readers find what they want easier. 9. Turn on the Pin It button. Allow people to pin your images to Pinterest! There is an option to do this under Settings > Marketing > Pit It Buttons. Even better, make sure that there is a pinable image in each blog post for people to pin - kind of like the one at the top of this post. 10. Create an archives page. Kind of like this one! People love organized content. They don't want to have to search to hard for what they are looking for. On our archives pages we've broken it down by category and made the first 4 posts in each category show. This is using a summary content block.